The Hansen quarter sheet is a hybrid between a traditional quarter sheet and a key hole, combining the best qualities of each. Our design includes a key hole with a Velcro closure at the pommel of your saddle. It can be worn over your legs to keep you warm for winter hacking or pleasure riding. It can also be tucked under the flap of your saddle where your billets are. This allows the rider to be able to canter, jump and have a full ride with the quarter sheet on. Your saddle holds it in place, and the cut out design at the bottom keeps it from interfering with your leg as you ride. 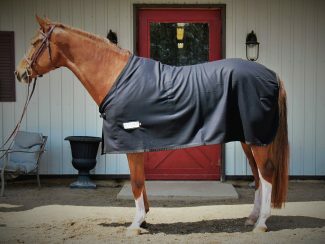 Our hybrid design also allows you to take the quarter sheet off if needed without having to dismount your horse. 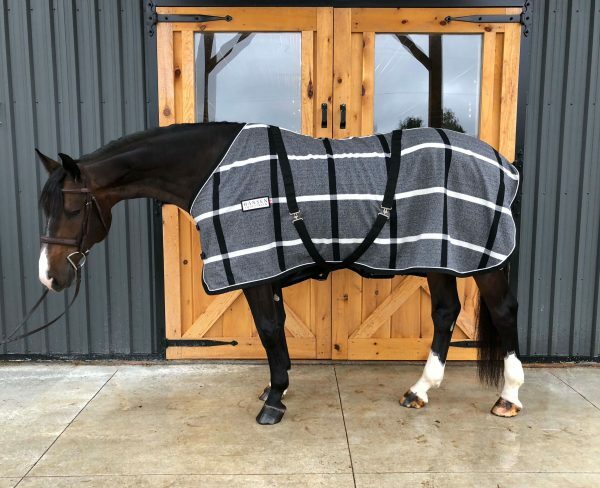 This is perfect for the warm up ring at horse shows and schooling at home. Made from both our velvet fabrics and lined with only the softest Berber fleece for those frigid days or our premium wools for lighter temperatures and sweat wicking, the Hansen quarter sheet is an essential for any winter rider.